Dronsfields is a specialist family-run business that has been in the replacement part industry for over 40 years. Founded in 1968 by Melvyn Dronsfield, the company originally solely dealt with and traded in commercial vehicles. However, a gap in the market was spotted and the decision was made to specialise in Mercedes Benz, which also enhanced the company profile. The company sought Mercedes commercial vehicles and they were at the forefront of the company for the next 20 years. Melvyn’s eldest son, Steven, joined Dronsfields in the late 1980s and immediately sought to increase the company’s vision in terms of the vehicles it dealt with. Introducing Mercedes domestic vehicles, the size and profile of the company began to grow. Angela Dronsfield officially joined full-time in 1994 and is now the Director of Dronsfields. With the family-run business ever-expanding, Angela now oversees the general management, whilst Steven handles the export side of the business. Youngest sibling, Ian, manages the busy sales office and his team are responsible for purchasing vehicles and parts which are used to supply the Dronsfields customers with high quality Mercedes parts. With such a focus on family, Dronsfields have ensured a high level of quality service throughout the decades. 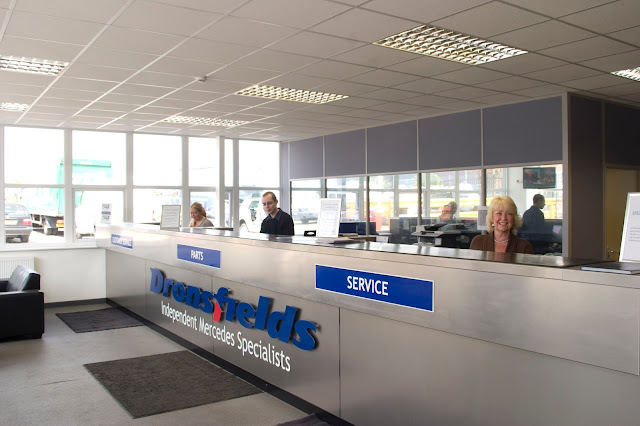 Now, Dronsfields employ over 50 highly qualified staff in departments ranging from a bustling sales office to the high tech dismantling department. The operating breaking yard in Manchester is constantly receiving a high turnover of new vehicles. Dronsfields has continued to grow and as well as a busy car and commercial parts department including the breaking yard, they boast high-tech workshop with Mercedes-trained technicians and the latest diagnostic equipment.